And welcome to a review of a potential Oscar movie. In October. I swear the classical awards season stars earlier and earlier every year and I don’t think I can keep up. Anyways, this is A Star is Born! IMDb summary: A musician helps a young singer and actress find fame, even as age and alcoholism send his own career into a downward spiral. A Star Is Born was written by Eric Roth, Bradley Cooper (who also directed and starred), and Will Fetters. The 2018 film was the 4th iteration of this story and the 3rd reboot of the original 1937 movie. All the films have differed slightly by having either movie or music stars in the lead roles. I really enjoyed the fact that this time around the focus was on singers and songwriters as when I’ve recently got pretty burned out with movies and their reviews, music became my new main hobby. Thus, this film was kinda the perfect combo of my old and new hobby. While the characters have shifted between different areas of entertainment throughout the reboots, the stories themselves have always been pretty similar. The same 3 plotlines were also used in the latest version: one’s career going up, the other’s career going down, and a simultaneous romantic involvement of the two stars, the up-and-coming one and the one whose career is in decline. I thought that the interplay between the 3 storylines was really good. However, I had some problems with the pacing of the story. The first and the seconds acts felt like they unraveled organically, however, the third one seemed rushed. The breaking points in both character’s career seemed quite sudden. Why did he completely fell off the wagon that suddenly when he had managed to maintain a steady-ish career up until that point? How did she break through that quickly and at that exact point? I guess that showbiz? One can never predict it? Bradley Cooper directed A Star Is Born as his directorial debut and impressed me immensely. The pacing, as I have mentioned before, was a bit strange, but the world-building and the visuals were great. I loved how the viewer got to be onstage with the stars and see an unseen side of a concert. The film could have been a tad bit shorter though. The soundtrack was good, ‘The Shallows’ was my favorite song and I could see it being nominated for an Oscar. In addition to directing and writing (and producing), Bradley Cooper (Joy) also played the lead and was great! I was also so surprised how good he was at singing! Lady Gaga had her first big screen role in this film. She has previously cameoed or had supporting roles and films and has worked on TV (on American Horror Story). I was lucky enough to see her live 6 years ago, in my first ever big concert which was part of the Born This Way Ball tour. She sounded splendid live back then and was equally as amazing (in both the singing and the acting) in this film! I could see an Oscar nomination in her future. A couple of important supporting roles were played by Sam Elliott, Andrew Dice Clay, Anthony Ramos, and Rafi Gavron. A few celebrity cameos could also be spotted but this was no Entourage. In short, A Star Is Born was a bit long but a neat musical romance with some stellar acting and singing performances! Another buddy comedy has hit theaters, so let’s review it! IMDb summary: Based on the true story of two young men, David Packouz and Efraim Diveroli, who won a $300 million contract from the Pentagon to arm America’s allies in Afghanistan. War Dogs is kinda similar to the other to buddy comedies of this summer – The Nice Guys and Central Intelligence, in that they all have a contrasting duo in a lead. The film also shares some topical similarities (greed) with Pain & Gain and even The Wolf of Wall Street. War Dogs was written by Stephen Chin, Todd Phillips, and Jason Smilovic, based on Guy Lawson’s book Arms and the Dudes, which was inspired by true events. The film’s narrative was fine – it had a few clever things to say about war, mainly, that was is an economy. It also explored the greed of people and portrayed it as the biggest flaw of humanity. Lastly, the movie touched upon the performative aspect of communication – War Dogs showed how specific individuals can read other people and modify their own manners and appearance to fit the vision that the others have of them. The first act of the film felt a bit choppy – I couldn’t figure out where the story was going, but in the middle of the 2nd act, everything started to flow nicely. War Dogs also had a lot of narration and, while, to my mind, it worked well, to a lot of movie-goers it is a bad thing. The picture’s ending was a bit abrupt, though. I did not feel that there was a full resolution and I also thought that the two criminals got away way too easily. Todd Phillips of The Hangover trilogy was at the helm of this picture and did a good job. War Dogs was quite a slow but really well made and entertaining film. I wanted to see a bit more action but I guess they decided to go the drama route and explore the relationship between the two characters. The intro montage set the stage for the upcoming story neatly and explained the premise clearly and concisely. I also liked the structure of the feature – how it was divided into a bunch of vignette-like parts. The names of these vignettes, which were just random lines of dialogue, were also cool and perfectly summarized the main ideas of these specific pieces of the film. The soundtrack wasn’t bad either. The two leads of the movie were played by Jonah Hill and Miles Teller. Their characters were both clever idiots, only Hill’s character was the more crazy and greedy one, while Teller’s character was presented as the protagonist, the everyday-man that the audiences are supposed to root for. Hill was amazing as the selfish Efraim Diveroli, the only element of his performance that annoyed me slightly was that laugh. He played a similar character in the already mentioned The Wolf of Wall Street. In addition, Hill isn’t new to the buddy comedy genre – his big break was in Superbad (the teen comedy about two guys), while in the recent years he has returned to the genre with Changing Tatum and 21+22 Jump Street. Now, Hill replaced Tatum with Teller but, thankfully, Hill’s and Teller’s chemistry is as good if not better. Miles Teller was also great in the role of David Packouz. I’ve told you numerous times that I’m a fan of his and was extremely soud after Fantastic Four turned out the way it did. I hope that Teller will start clicking with the audiences soon, because he is a really talented actor. If you don’t belive me, just watch Whiplash. He was also good in small comedies 21 and Over, Two Night Stand and That Awkward Moment. Going forward, Teller has a boxing movie coming up as well as a drama and an action flick. I don’t know if he will return to the Divergent franchise as the last installment of that series is still up in the air and will probably go to the TV. An important supporting role was played by Bradley Cooper who also produced the picture. Cooper was fine in the movie but I was actually much more interested to find out that he produces basically all his big films like Silver Linings Playbook, American Hustle, and American Sniper. Going forward, he has a few voice roles for Marvel/Disney and Universal. In short, War Dogs was a fine summer picture that had a great release date – if it would have come out earlier in the summer, it would have probably been burried underneath the big blockbusters. The film had okay directing and writing, while the standout feature of the movie were the performances of and the chemistry between the two leads. As you may know, I am a huge Marvel fan. I read Marvel comics, watch Marvel TV shows and one shots, can’t wait for Netflix series but most importantly I love Marvel Cinematic Universe’s movies (However, I also watched old Marvel movies like Daredevil and Blade). So, I was beyond excited to finally see Guardians of the Galaxy – the funniest, wittiest and quirkiest Marvel movie to date. Summary: After stealing a mysterious orb in the far reaches of outer space, Peter Quill, a half human/half alien is now the main target of a manhunt led by the villain known as Ronan the Accuser. 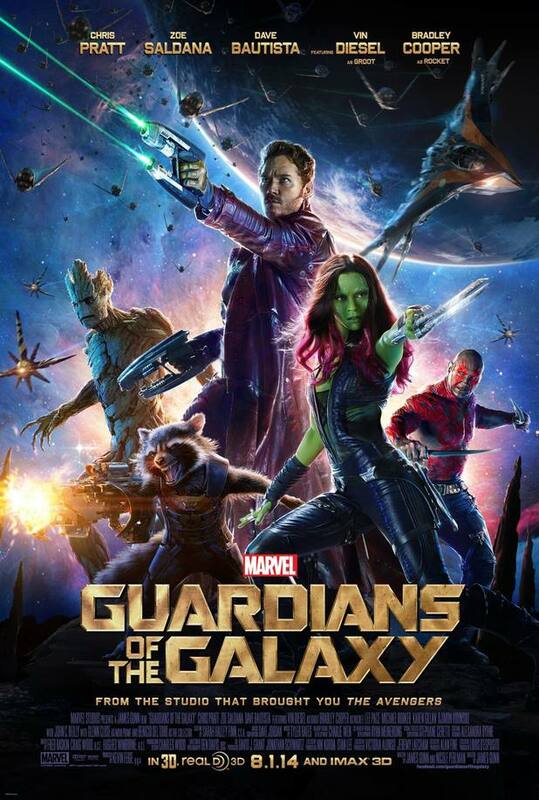 To help fight Ronan and his team and save the galaxy from his power, Quill creates a team known as the ‘Guardians of the Galaxy’ to save the world. I loved everything about this movie starting with the characters and ending with the soundtrack. It actually might be my favorite Marvel movie to date. My favorite character, of course, was Rocket Raccoon but Chris Pratt’s Star Lord was also a great leading man. Groot was so adorable, especially at the end when he was dancing. Zoe Saldana as Gamora was also amazing; I enjoyed her fight with Nebula. The only character that I wish they have worked more on was Drax. The villain (Ronan) was okay, he is not the next Loki, but pretty good. I wish we would have seen more Thanos but I guess they are saving him for Phase 3. The storyline was also really cool, I like the fact that we got back to Infinity gems/stones storyline like in Thor 2, Avengers. If you want to know more about these gems I suggest you read Thanos Quest comic books by Jim Starlim, Ron Lim, John Beatty, and Tom Vincent. The whole story is super short (2 issues) but it gives you more information on what these gems can do and why Thanos is doing what he is doing. Finally, we have to mention the soundtrack of this film – it was superb. You wanted to dance all the time. I went to this film on an opening night and the cinema was full of die hard Marvel fans and all of us were singing Hooked on a Feeling when it came up on screen. Comedy was wonderful as well. I laughed more than I would laugh in a comedy movie. I also give huge props to Marvel for going in this easier, lighter, funnier direction. Another Marvel movie we got this year – Captain America 2 –was completely different, dark, moody, and serious. And this one was like a breath of fresh year after such a dark period of Hydra infiltrating S.H.I.E.L.D. About 50 people from 300 stayed through the end credits and we were rewarded and finally got to see the character we have been waiting for a long time. I liked the post credit scene but I am not sure if it was just an Eater egg for fans or if they actually are going to do it. I wish they would have showed that Avengers 2 comic con trailer after this movie. The next film in Marvel phase is Avengers Age of Ultron . Sadly, Guardians won’t be in it but don’t be sad – a sequel has already been announced and is scheduled to be released on July 28, 2017 as a part of Phase 3. Director James Gunn will return so the tone of the movie will be the same.